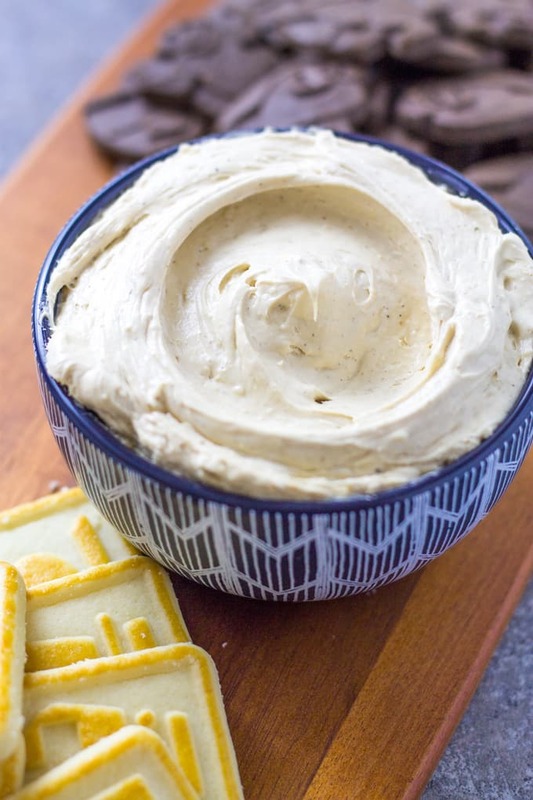 Chai Latte Dip - A Morning Must-Have for an Evening Dessert! Your morning cup of Joe is now a fun dessert with my Chai Latte Dip. Creamy, spicy, and a hint of coffee will make your afternoons and evenings just as nice as your mornings! How do you get through your morning? Are you so addicted to coffee that you need a few pots before you leave the house and still require a stop at Starbucks on your commute? I definitely need caffeine in the morning but I drink iced tea instead of hot coffee. Yes, this is completely foreign to everyone in my family who collectively drink a 55-gallon drum of the stuff every morning, but it’s hot out here in the desert! Regardless of how I get my caffeine fix, I still have to have it in the morning to get moving. This means that sometimes I hit the coffee house on my way to hot yoga but I skip the coffee and get a shaken iced tea with no extra water. If its cold outside, I might opt for a hot tea or even a Chai Latte! 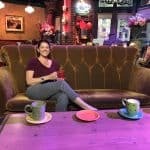 I used to get quite a few Chai Lattes from a particular coffee shop until I found out how much sugar is in those babies! No thanks, I’ll stick with my homemade version and save some calories and moolah. What is in a Chai Latte? A chai latte is just a traditional latte comprised of espresso and steamed milk but where the espresso is replaced with a chai or tea concentrate. A little hint as to where the extra sugar comes from at the big coffee house! Really us Americans should call it a tea latte because there is a ton of confusion as to whether it is called Chai Tea, Chai Tea Latte, Chai Latte, Masala Chai, or Masala Chai Latte. Let’s get the vocabulary right before we continue down this path. My Chai Spice recipe, which is a tame version of Masala, contains most of these but with ginger and nutmeg added. Fennel and anise are usually optional and only added to the mix as a matter of personal taste. The term Latte is used to describe a shot of espresso/tea with steamed milk. SO really, the Chai Latte that you are gulping down is really a Masala Chai steeped with water and sugar to make a “simple syrup” of sorts with spices and then added to steamed milk. No coffee included! Many people consume these drinks for the caffeine benefits but also because they like the taste! While I was working on recipe variations of sweet dips to go with my chilled Boozy Banana Cream Pie Dip and my Oatmeal Cream Pie Dip, I started thinking about those warm lattes. This is how this Chai Latte Dip was born! If you are stoked about this coffee recipe, you might also like these Espresso Macarons, these Chocolate Coffee Frozen Pops, and this Coffee & Doughnuts Ice Cream Cake! I start out with my traditional sweet dip base of cream cheese and powdered sugar. To keep it lighter than the other dessert dips and let the spices really shine through, I add in some whipped topping. The Chai part is added by way of my Homemade Chai Spice and the Latte comes in with some espresso powder. A little bit of vanilla extract and we are ready to go. 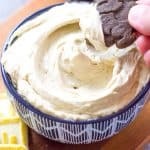 By adding the chai spices and the instant espresso powder to the whipped topping instead of the cream cheese part of the base you get a better incorporation of flavors because the powders can dissolve more easily in the whipped topping. Really the Chai Latte Dip should be called the Masala Latte Dip because it uses “masala” spices and espresso instead of tea but because there is so much confusion between the names I went with the most popular one. 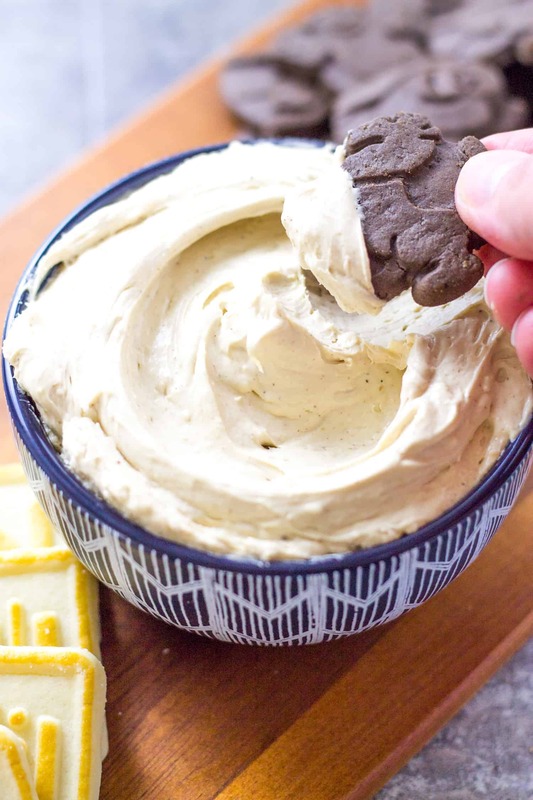 My Chai Latte Dip will smell like the Chai (tea) Latte you are used to getting, give you that much-needed caffeine boost with espresso, but is still cool and creamy like a dessert dip. Eat it with shortbread cookies, chocolate cookies, or even fresh fruit. I bet a dollop of this on your morning yogurt or doughnut will work nicely too. How do you take your coffee in the morning? If you are looking for a new way to enjoy your cup of Joe, try my Chai Latte Dip! Mix the espresso powder into the whipped topping and stir for a minute or two to incorporate it and let it dissolve. Add the Chai Spice Mix, vanilla extract, and powdered sugar. Add the softened cream cheese and mix to combine. Refrigerate for at least 10 minutes to firm up before serving. Serve with chocolate wafers and cookies! 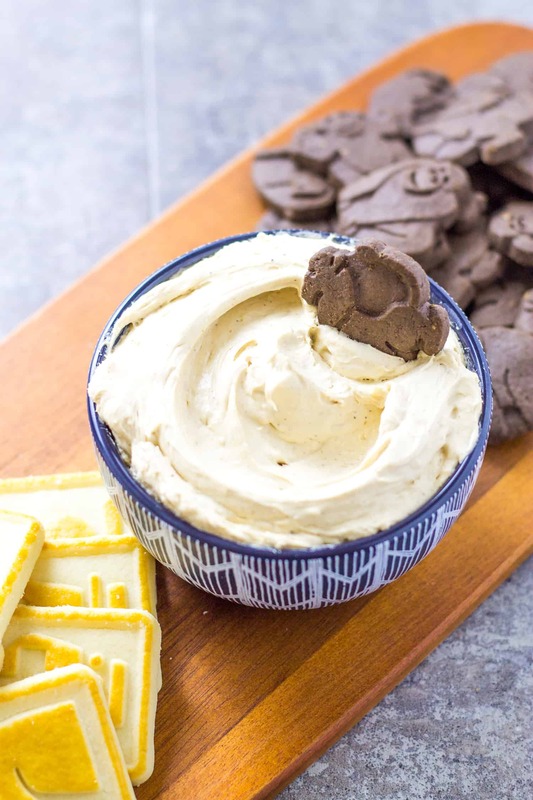 Serve with chocolate animal crackers and shortbread cookies. 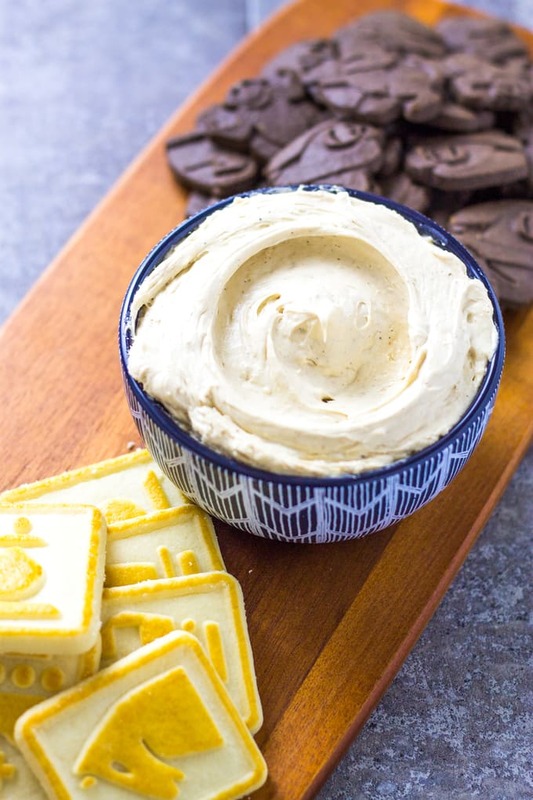 I love the idea of enjoying a chai latte dip! I am definitely a coffee lover – but I adore tea too – especially in the form of a chai latte!